Like Netflix for your neck. Your lady will think you look super queue-t.
During the ESPN broadcast of the BCS National Championship Jan. 9, Auburn University football head coach Gene Chizik, a guest commentator, drew heat from Alabama fans nationwide for his choice of a gold tie similar to colors of the Tide’s opponent, LSU. While Chizik defended the color choice as a “good look,” he could have rubbed it in even more by changing into different colored ties during each commercial break — say a purple, navy or burnt orange tie — had he only been a member of TieTry.com. TieTry.com, a business built off the Netflix model, is the brainchild of 2003 Auburn graduates Scott Tindle and David Powers. It allows subscribers the opportunity to “borrow” ties just as Netflix allows users to borrow movies. After watching an episode of ABC’s show “Shark Tank,” in which a panel of wealthy celebrities and entrepreneurs negotiate investment deals with budding entrepreneurs, Tindle and Powers were inspired by one contestant, who applied the Netflix model to children’s toys. After throwing around several ideas, Tindle and Powers settled on ties. Both are attorneys and each must wear ties at least four days a week. After a year of planning and working on the business model, Tindle and Powers finally launched TieTry.com last week, and Tindle said the response has been overwhelmingly positive. The response has also been fueled by an ironic twist of fate that occurred at almost the exact same time as the launching of the website. “(Taco’s) obviously a smart guy,” Tindle said with a laugh. “We wish our site would have gone live right before the show, but we’re happy either way. “We think it’s a win-win all the way around,” he added. 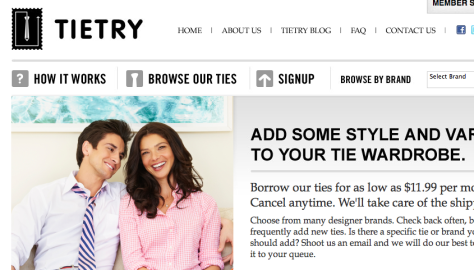 Prices for TieTry.com range from $11.99 per month for one tie at a time to $29.99 per month for five ties at a time. “Basically, for 25 bucks a month, you could never wear the same tie again,” Tindle said. Tindle said the business currently has an inventory of approximately 200 different styles of ties, ranging from traditional neckties to bowties. The business works just like Netflix in that a customer goes online, selects the plan they would like, chooses the tie(s) they would like and TieTry.com immediately ships the selected tie(s). Customers are allowed to keep the ties as long as they would like, or they can go online to set a queue of future ties they would like to try. Once TieTry.com receives the returned ties, the customer’s queued ties are immediately sent out. All ties are inspected upon return, treated for spots/stains, sanitized and returned to inventory. Any tie that doesn’t meet inspection requirements is thrown out and the customer is charged a replacement fee. “We’ll never send you a tie that I wouldn’t wear in front of a client,” Tindle said. Following the 1988 Sugar Bowl, in which Auburn rallied to tie Syracuse 16-16 on a Win Lyle field goal instead of going for the touchdown and the win, a Syracuse radio host sent Tigers’ head coach Pat Dye thousands of neckties in protest of the coach’s decision to go for the tie. In response, Dye signed and auctioned off each tie, raising more than $30,000 for Auburn’s general scholarship fund. Tindle hopes his business will soon have the same success as Dye did with his ties. “Maybe we can get (Dye) to be our spokesman,” Tindle said with a laugh. TWER readers who would like to try TieTry.com will receive a 50 percent discount on the first month by entering promo code TWER. Totally need to get Coach Dye as a spokesman! This is brilliant!!! I immediately thought of Neckflix, & I’m sure a lot of other people will, too. What great timing for these guys! Interesting idea. I have two shoe boxes full of ties I never wear, plus three ties that I’ve worn about a million times each. Ties are expensive and I can definitely see the draw. I have to wear ties 4 or 5 days a week myself. But I hope they are serious about that sanitation thing. Your tie goes through some gross stuff during the day. Think about it guys. Not all dudes throw the tie over their shoulder before stepping up to the urinal. Thanks everyone! Remember to use coupon code TWER when signing up in order to get 1/2 off your first month (you can cancel at any time). Email us at [email protected] or [email protected] if you have any questions. War Eagle! Tietry, two questions, is there any sort of trade in/donate system and are there any tacky ties (for the tacky tie party that comes up time to time)? Also just found you guys on twitter hope to see more updates there, great idea! Miller Time – We don’t carry any tacky ties (at least not intentionally!). Good question about the trade-in system. We have considered that idea, but don’t currently have a formal system in place. But, if you are interested in trading ties for membership credit, shoot us an email and we would be happy to work something out with you if you have ties that we would be interested in using on the site. I think you should approach Dad about this. His idea to sign the “Dye-ties” came from being ribbed about going for the tie rather than the win and from his mother’s advice “there’s a silver lining in every cloud”…He wanted to use the ties as the ‘silver lining’ (fundraiser)…Contact him about it, he would love the idea. Very cool concept, wish you guys lots of success. And nice article, Austin! Glad to see you writing for TWER now.. I thought this was a great idea—-When I saw the exact same thing on an episode of “The League” last year.